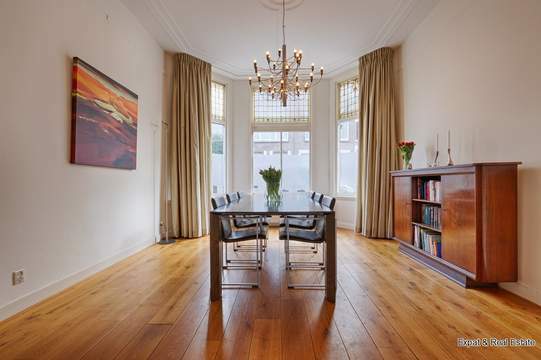 In one of the most popular neighbourhoods of The Hague we offer a spacious, FULLY FURNISHED, luxury apartment of 100 m2 located on the 4th floor. The apartment is very well maintained, has a spacious living room, open kitchen with all appliances, 2 bedrooms, luxury bathroom with bath and shower, very spacious, sunny balcony. Also there is a PRIVATE PARKING PLACE and ELEVATOR! The apartment complex is located very central, around the corner of the shops and restaurants. Also Central Station and the old city centre of the Hague can be reached within 5 minutes by bike. Conveniently located to all public transport and main roads. entrance with call tableau and mailboxes. entrance hall with wardrobe, spacious toilet with sink, spacious living room with fantastic views and very sunny, spacious balcony. Half open kitchen equipped with fridge, freezer, dishwasher, oven, microwave, ceramic hob and extraction fan. 2 good-sized bedrooms, spacious bathroom with bath, separate shower, washbasin and design radiator. Separate laundry room with washing machine and dryer.